Continuing with our mission to encourage cross-cultural exchange and balance the stress of student life, International Student Affairs collaborated with Recreation and Intramural Sports for yet another time to organize the Hofstra World Cup series. 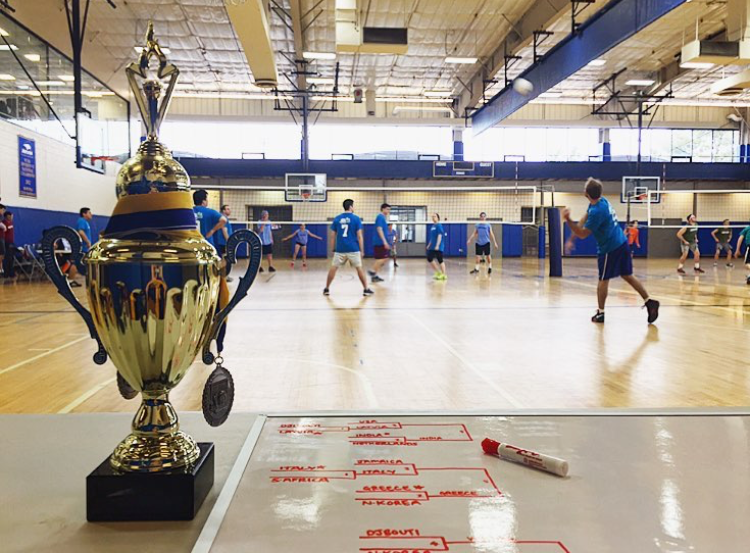 Hofstra Volleyball World Cup took place on Saturday, February 20, 2016 at the Hofstra Mack Fitness Center. It was a one day indoor volleyball tournament where 10 different teams like Netherlands, India, Italy, South Africa, Djibouti, USA and Latvia to name a few participated in this exciting event. It was a double elimination event where winning team would progress to the next level and the losing team would get another chance before getting eliminated. After 18 action thrilled games, team Jamaica walked away with the title of winners of Hofstra Volleyball World Cup while Team Greece had to play some hard fought games to end up as the runners up. All participating teams in the event were provided with t-shirts, Gatorade energy drinks, and water with the winners receiving intramural championship t-shirts, Hofstra scarves, and this magnificent trophy. Hofstra World Cup is organized once per semester with a different sport every time in order to promote friendly relations among international and domestic student population at Hofstra University and encourage a sense of sportsmanship and team work in our students.